Sony just announed its SmartWatch Bluetooth sidekick to your phone has now arrived in the US and it could be yours for $150. The SmartWatch is actually the second wristwatch by Sony, and just like the first one it works in conjunction with your smartphone. Almost all of the SmartWatch’s features depend on having a strong connection to the phone. So what does the SmartWatch do? You can check the time, of course, on the 1.3-inch display, but also do more than that. Reading emails, controlling the phone’s media player and use it as a remote for the phone’s camera are all among the features. The whole experience actually depends on developers and what they come up with. So far there are around 60 apps for the SmartWatch. But in order to change some information, you’d be likely forced to reach for that phone. “If somebody is thinking of using a device without their phone, this is not the product for them,” Sony’s Stephen Sneeden explained. If you’re looking for alternatives, probably the hottest device to check out is Pebble - a Kickstarter project for an iPhone/Android-compatible phone that looks awesome and costs slightly less. It’s still a project in the making, though, so don’t expect to get it earlier than this September. There’s also the Motorola MotoACTV, but get ready to swallow a bitter price of nearly $250. April 12, 2012, Atlanta, GA –Sony Mobile Communications announces the availability of its new SmartWatch, a wearable device that extends the power of Android smartphones by sending timely and personal information from your smartphone straight to your wrist. A vibration and screen alert notifies you of key events, like an incoming call. It also allows you to read texts and emails as well as receive FacebookTM and TwitterTM updates – all from your wrist. SmartWatch from Sony connects to Android smartphones via BluetoothTM giving you the ability to control key functions without removing your smartphone from your pocket or bag. With just a tap, touch, and swipe, SmartWatch turns from a watch displaying the time to a remote information center for your Android smartphone. A growing number of apps are available for download through Google Play – including those for social updates, workouts and music – all customized for the 1.3-inch OLED SmartWatch touch screen. While SmartWatch works with these existing apps, Android developers can create apps specifically for the device. SmartWatch works with most Android (2.1 and above) smartphones. "SmartWatch is the first of many Smart Extras that seamlessly connect and expand the smartphone's reach and user experience," said Paul Hamnett, President and Head of Customer Unit, North America, Sony Mobile Communications. "Designed to break free from the single screen experience, SmartWatch provides access to live content and entertainment on the go." The durable SmartWatch is dust proof and splash proof and comes with a black rubber wristband included in the box. Wristbands in five additional colors are available for purchase. SmartWatch's design includes a rear mounted clip, so it can be removed from the wristband and attached to clothing or a belt. At launch, SmartWatch has a suggested retail price of $149.99 and will be available at http://www.sony.com/smartwatch and Sony stores. SmartWatch availability at additional retailers will be announced soon. 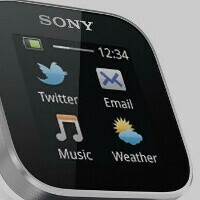 SmartWatch is part of Sony Mobile Communications' strategy to create Smart Extras that make Android smartphones smarter. Apps: All events (displays in chronological order), Messaging (SMS/MMS), corporate E-mail (for SonyTM and Sony Ericsson Android phones), Gmail (for all other Android smartphones) Calendar Notifications, FacebookTM, TwitterTM, Music Player, Call handling (call, mute, reject, or answer and send pre-defined SMS), Pre-defined SMS, e.g. missed calls – I'm busy, messaging - call me, email – ok, Battery strength, Find phone, and Weather widget. Plus lots of apps on AndroidTM market. I like it, this will be great when my phone is in my inner jacket pocket and is too difficult to dig out, I'll add it to the list! This is a really great idea. I agree this is a little steep in price but I might check this out. Well... Can i get a nice watch and not that design joke? Two times the price of how my phone is priced right now. lol too damn expensive!! come on Sony if you want to sell price it around $80 or so!! One of the reasons why live view didn't sell was its price!!! i already have it..i got it for free from phones4u uk as i pre-ordered my xperia s..its really good since you can avoid taking out your phone from the pocket or bag in crowded areas and you can read messages, emails, get weather updates, change and skip tracks etc..the best thing is you can change the strap and use your own starp instead of the lame rubber one..
My Swatch (Which is considered cheap) costs 200$. This thing costs 150$ and does magic for me. This smartwatch is water resistant?